ANYONE CAN BE A COMPOSER/SONGWRITER! Usually, people have to spend months or years to learn Western music theory to become a composer/songwriter. Because there are a lot of stuffs in Western music theory such as staff (stave), time signature, key signature, measure, vertical bar lines, bass clef, treble clef, tie, slur, dot, tuplets, etc. 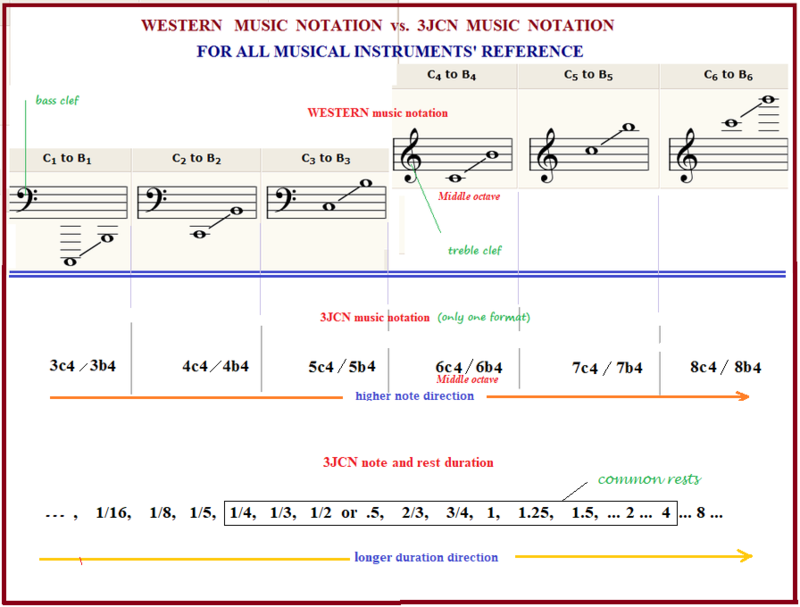 Now, you just need five minutes to know 3JCN notes and rests, then you can start to write your own songs. Later on, you can download your song's midi file. Then you can import the midi file into music softwares (DAW) like Steinberg Cubase, Ableton Live, Garageband, Cakewalk Sonar, FL Studio, Apple Logic Pro, Sony Acid, etc. for editing, recording, mixing and mastering the audio file. In short, you don't need to know Western theory to produce your songs.